Maybe it's because I don't like coffee that much, or maybe it's because my taste buds are overloaded with pumpkin, but I wasn't particularly thrilled with this coffee. Sonia enjoyed it, however, and insists that this product is the first Trader Joe's pumpkin item this season that does have an adequate amount of pumpkindiculous flavor. I feel the opposite. I was happy with the pumpkinicity levels of our previous selections, but not with this one. We recently tried a Krispy Kreme pumpkin coffee beverage that was really sweet and really punkinny. It was a hit with the whole family. It tasted like candy. This coffee...well...tastes like coffee. It reminded me a little of the Gingerbread Coffee we tried one chilly Yuletide long ago. Neither selection tastes bad, but both need a fair amount of sugar and milk to be palatable, in my opinion. There's a hint of pumpkin spice, but other than that, I just taste normal old coffee, complete with bitter earthiness and a bit of acidity. But I'm no coffee connoisseur. I'm slowly earning my stripes as a pumpkin-flavored-thing expert, but I'm not sure how that will help me in life outside of this blog. A few weeks into this fall season, and I think Sonia and I have overdone the pumpkin thing a bit. I'm starting to wish there were more fall-themed items that did not involve pumpkin. There are always harvest apple type dealies. And apparently, some sausages are associated with autumn. So maybe on our next Trader Joe's trip, we'll look for more stuff like that. But you folks who are jonesin' for more pumpkin, don't worry, we've still got a couple more pumpkinlicious product reviews coming down the pipeline. Plus, apparently Sonia is not ready to give up this nasty pumpkin habit. Even as I compose this post—I kid you not—she just sent me an email with the subject line: "Made with Real Pumpkins!!" Apparently Yogurtland is jumping on board the pumpkin bandwagon. Sonia gives this coffee 4.5 out of 5 stars, stating that she likes the way the pumpkin spices and the medium roast flavor blend together. I give it 2.5 out of 5 stars. I agree with you, Nathan. 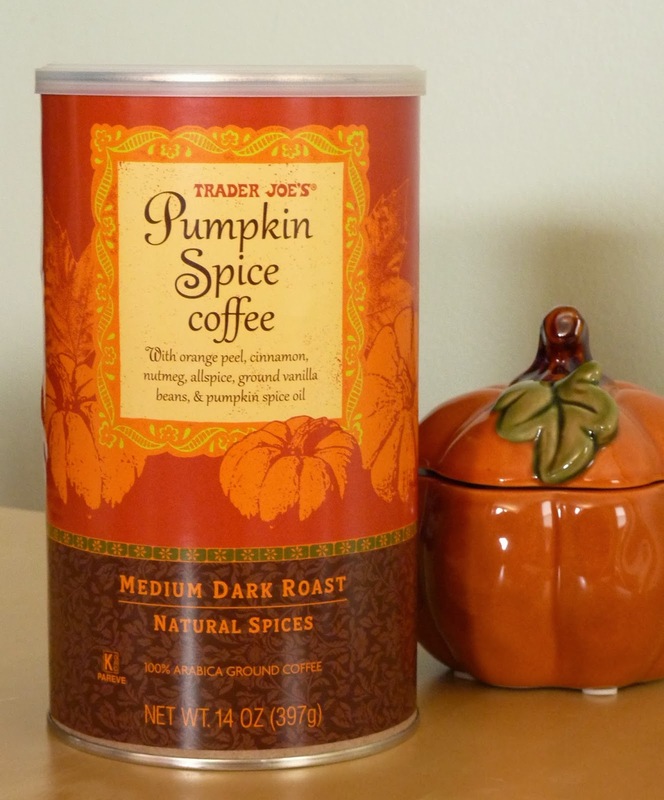 I love coffee and anything pumpkin, but I bought this last year and it was undrinkable to me. I tried to drink it several times, and ended up giving it away. I'm generally not a fan of pre-flavored coffees. If I want Irish cream or vanilla, I'll add a splash of Irish cream or a shake of vanilla powder to my brewed coffee. I haven't tried this coffee, but I do like pumpkin spice coffee. So, I just add a shake of TJ's pumpkin spice to my regular brewed coffee, and it's great! Good point, and excellent use of the word "pumpkinosity." Wow! I wonder how this one taste? This is my all time favorite coffee at TJs! I wait all year for it, and buy a few, since it usually sells out fast at my local store. I love all the flavors in it, especially the orange peel. The secret to my super enjoyment though is a dash of vanilla creamer! The creamer is sweet, so you don't need to add sugar too. I also cut the pumpkin coffee with a little plain coffee. So yes, it needs a bit of doctoring, but its so worth it. Yay pumpkin coffee! Sonia would definitely agree with you! I bought this coffee yesterday and loved it. I think the amount of pumpkin flavor is perfect and not overwhelming. Yep, a little vanilla creamer goes perfect with this! Vanilla creamer would have been good with this! Have been enjoying the tj pumpkin coffee this week. The husband and I like to put eggnog in ours although we have been known to add a healthy dose of Bailys also. Hmmm...both of those additions sound pretty good, Kathleen!